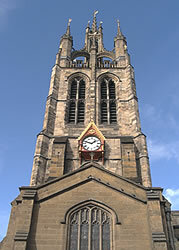 Newcastle and Gateshead are cities on the north and south side of the River Tyne (the whole area is known as Tyneside). 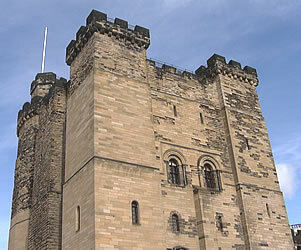 Newcastle has a population of about 260,000, and the population of Gateshead is about 190,000. The cities expanded during the Industrial Revolution when the area was a major centre for coal mining, steel production and shipbuilding (none of these industries are major employers here these days). 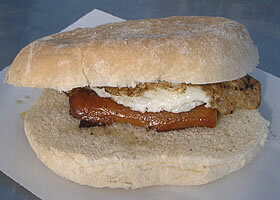 People from Newcastle are known as Geordies. 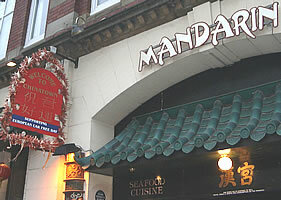 The city has a lively nightlife. 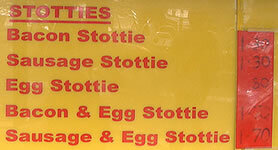 The local accent is quite strong (some people may find it hard to understand at first). 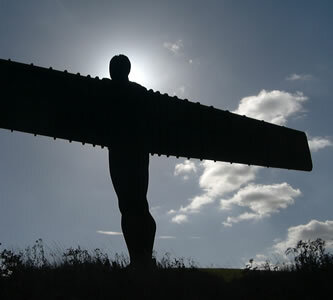 The Angel of the North is the largest sculpture in Britain. 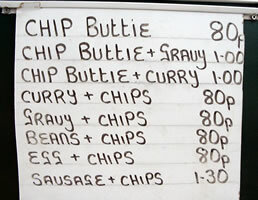 It is located on top of a hill in Gateshead (an area which was once used for the coal mining industry until the end of the 1960s). 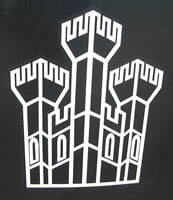 You can see it if you come to the area by road or train from the south. 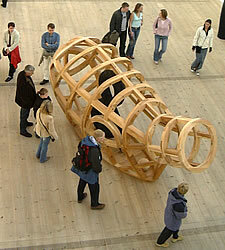 It was created by the British artist Antony Gormley, and completed in 1998. 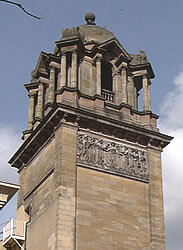 It is 20 metres (65 feet) high (the height of four double-decker buses), and 54 metres (175 feet) wide (about the same width as a Jumbo jet). 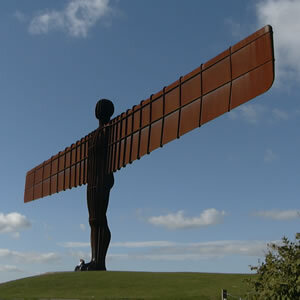 The shape is that of an angel, whose wings are angled slightly forwards as a sign of welcome. 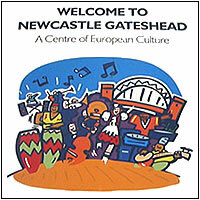 Newcastle and Gateshead are on the route of the first main road / motorway (the M1 and A1). 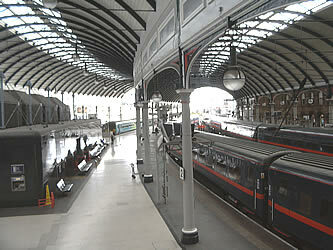 They can also be reached on the east coast railway line from London to Edinburgh (the fastest journeys from London King's Cross take about 3 hours). 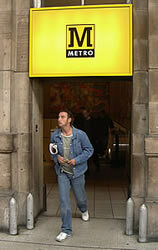 Within Newcastle and Gateshead there is a convenient local metro system. 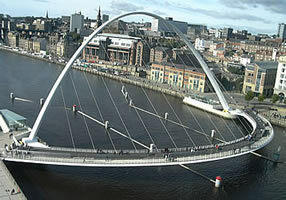 Several bridges cross the River Tyne to link the cities of Gateshead and Newcastle. The Millennium Bridge during a "tilt"
The High Level Bridge was completed in 1849 (it was built at the same time as Newcastle Central train station). 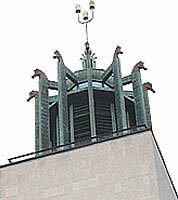 It has two levels: the top level is for trains, and the lower one for road transport. 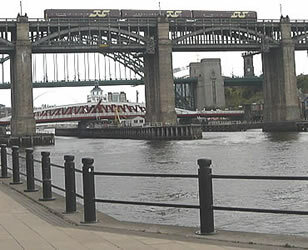 The bridge was built by George Stephenson: a man born a few miles outside Newcastle who was a leader in the development of railways and locomotives (see: http://www.spartacus.schoolnet.co.uk/RAstephensonG.htm). 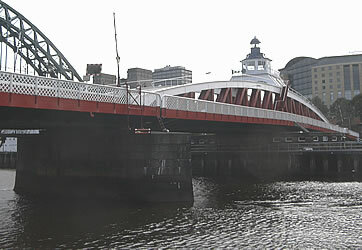 The Swing Bridge was opened in 1876, and can be rotated to let ships go past. 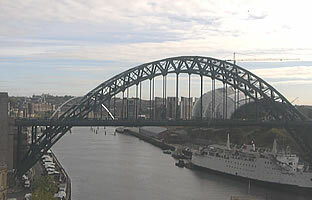 The Tyne Bridge was finished in 1928: at that time it was the largest single-span bridge in the world. 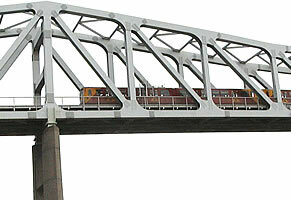 The Queen Elizabeth II Bridge was built more recently and is used by Metro trains. 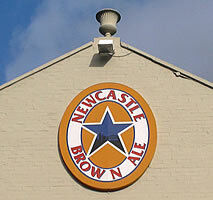 Newcastle Brown Ale has been brewed in the area since 1927. 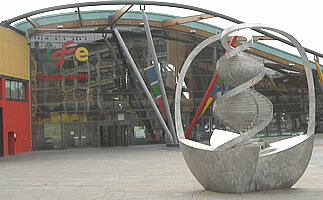 The former Baltic Flour Mill on the Gateshead bank of the Tyne has been converted into one of the largest international centres for modern art outside London. 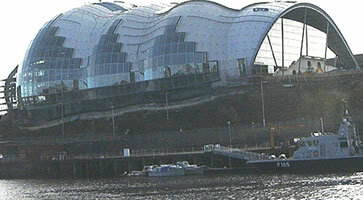 For more information about the Baltic Art Gallery: http://www.balticmill.com. 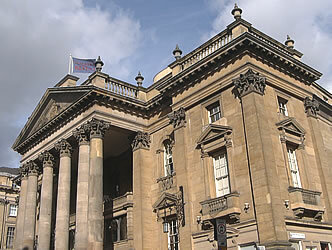 In the centre of Newcastle is the Laing Art Gallery: http://www.twmuseums.org.uk/laing. 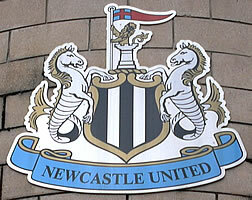 Many local people support their football team Newcastle United, which is sometimes called the Magpies. 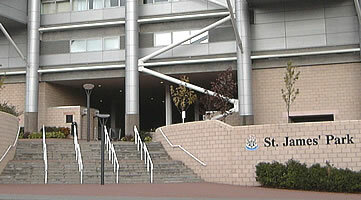 Supporters may be referred to as the Toon army (Toon is a local word for "town"). 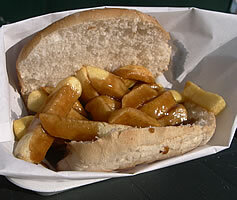 The football stadium is called St James' Park. Michael Owen moved from Real Madrid to Newcastle United in September 2005. 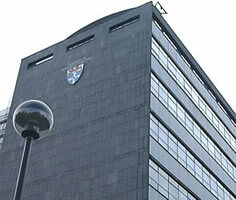 There are two universities in Newcastle: the University of Newcastle-upon-Tyne (http://www.ncl.ac.uk) and Northumbria University (http://northumbria.ac.uk). 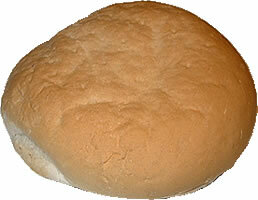 Below are some pop musicians or groups who are associated with Newcastle, together with the name of one of their songs. 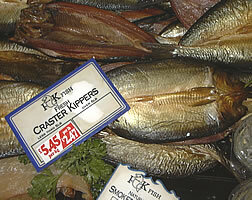 How many of these do you know? 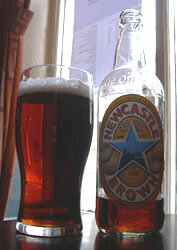 "Newcastle is a great city, with a fierce sense of pride ... In recent years Newcastle (and adjoining Gateshead) has seen epic new development ... Newcastle's centre has steep 19th-century streets that dive down towards the Tyne, allowing glimpses of the eclectic seven central bridges ... Although Newcastle is dauntingly large, the city centre is walkable, and the Metro underground system (convenient for hostels and B&Bs) is cheap, efficient and pleasant to use"